St. Louis University High School and Chicago St. Ignatius Prep High School may share the same mission as members of the Jesuit order. They also appear to hold the same goal of sponsoring outstanding post-season high school distance running competitions revolving around the MILE. 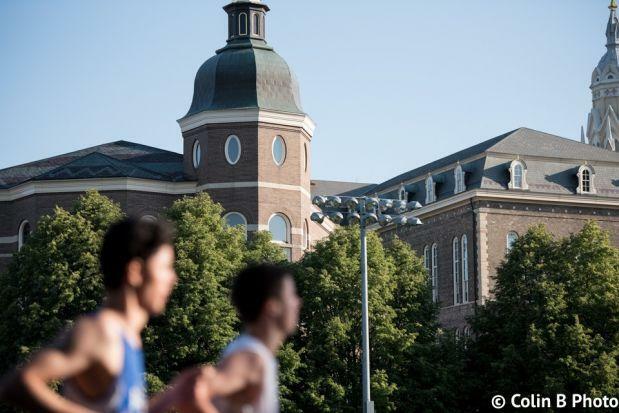 SLUH sponsors the Festival of Miles typically on the first Thursday evening in June at their majestic high school. In typical Missouri hot and humid climes, the athletes lather themselves well in sweat, blood, and tears to run some of their fastest times of the season. St. Ignatius holds their Magis Miles beyond the backdrop of the beautiful Chicago skyline on the first Friday of June. The weather in Chicago in early June is typically warm but at times it can be sub-optimal on the cooler side. But just like SLUH the goal is to run unapologetically fast. In the spirit of comparison let's see who came out on top. Keep in mind that it was 84F and very humid in St. Louis when the national anthem concluded. In contrast, the temps in Chicago was 58F at 7p. By rule distance runners favor cooler weather when they compete. The stats below will tell a story only you can explain. Enjoy!